Students and staff came up with creative ways to display kindness and support to others in their school and throughout their community. The Nathaniel Woodhull school community celebrated the festivities by designating a special theme and activity to each day, including reading a book based on kindness and writing kindness letters to others. Students made cards for children currently staying at the Stony Brook University Hospital Pediatric Oncology unit to help lift their spirits and collected food for the local food pantry to help those in need. 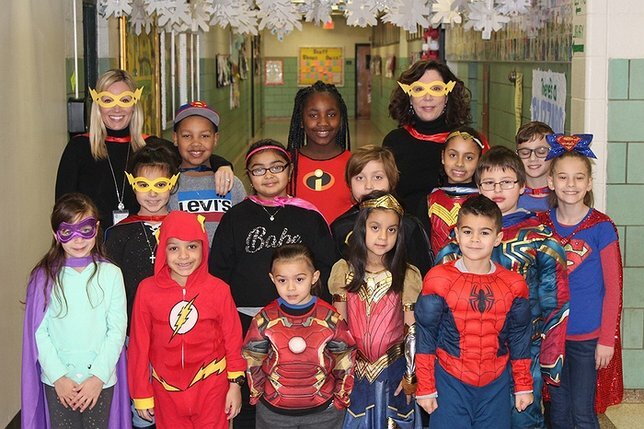 Students wore ties as they were “tied” together by kindness, dressed in the jerseys of their favorite sports teams and as their favorite superheroes, which in some cases was a family member who has served as a police officer or in the military. Students also wrote special appreciation notes to their classmates and teachers on a board displayed outside of the cafeteria. Subject: LongIsland.com - Your Name sent you Article details of "Nathaniel Woodhull Elementary School Celebrates Kindness Week"